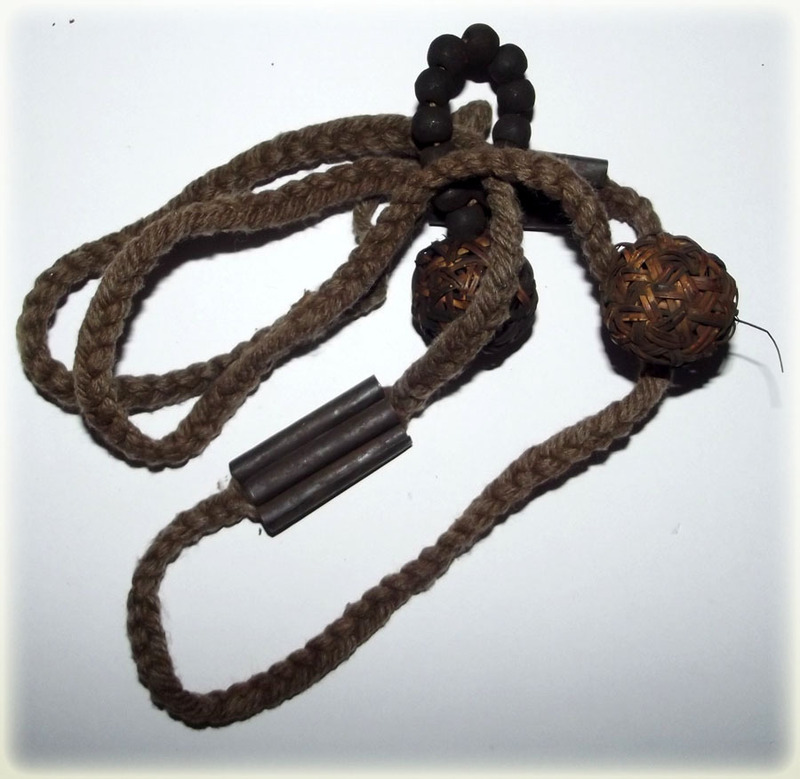 Famous Kong Grapan Klaew Klaad top 'Krueang Rang' (Talisman) type amulet including Takrut Tone leaden Yantra with the famous 'Look Takror' whicker basket ball amulet, so famous along with the Yant Look Takror Yantra Cloth, from Luang Por Sud of Wat Ka Long. 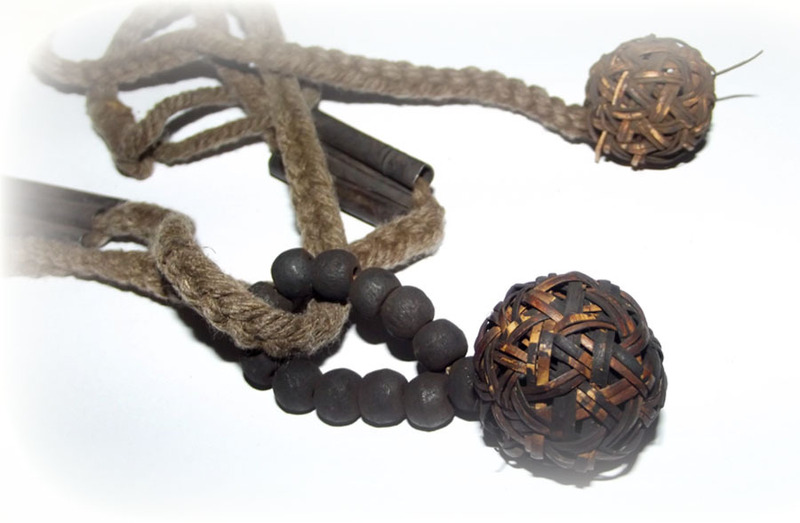 Takrut Yant Look Takror + Prakam Look Takror by Luang Por Sud (Wat Ka Long) - Takror Rattan Basket Yantra Magic - Takrut on belt with Look Takror, and a small Rosary with Look Takror. We do not wish to separate these ancient and rare items, for it has taken time and chance for them to both come together again, so should they stay, as one set. 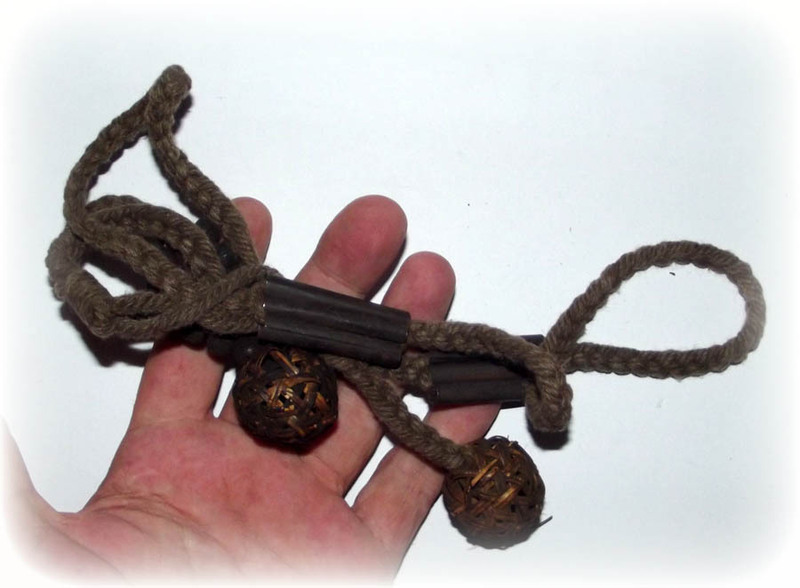 Luang Por Sud, and his Amulets, and His famous Yant Takror and Takror Balls are amongst the Popular 'Niyom' Class of Preferred Guru Masters, of a High Class but with a still affordable pricetag, despite their ever increasing rarity and difficulty to encounter when seeking an item from this Master. 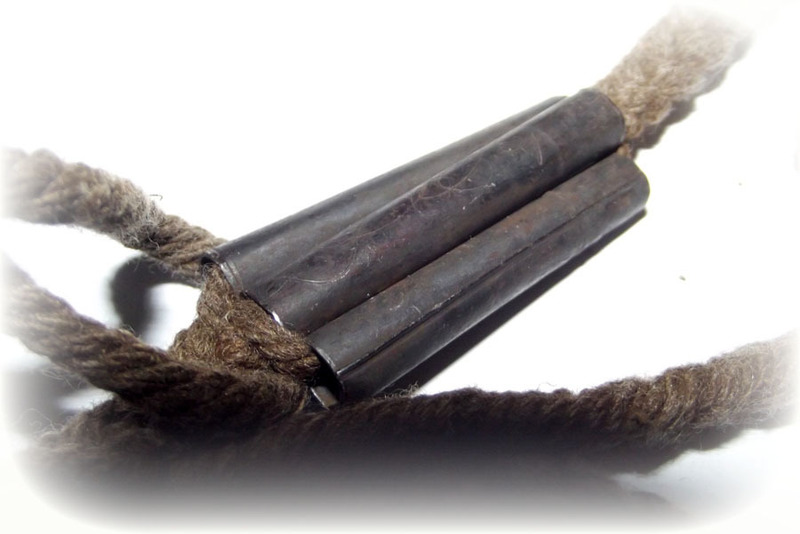 The Takrut is estimated to have been made at around 2490 BE. 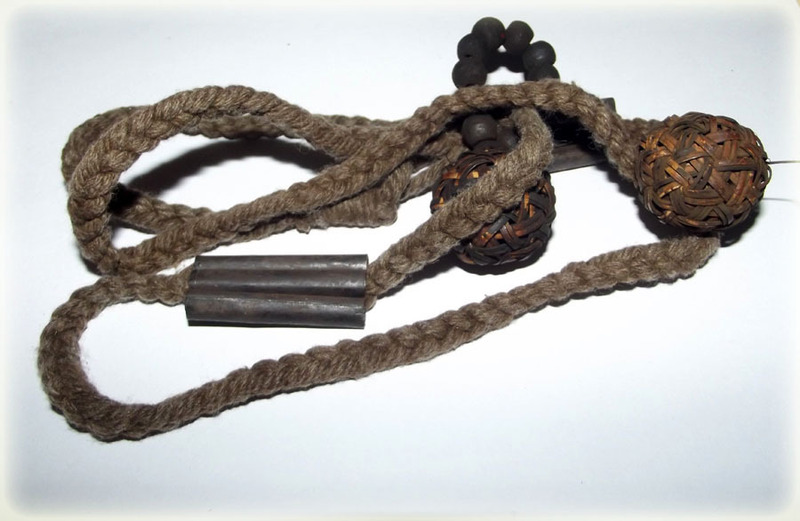 This Ancient Amulet, is said to have been the favor of the Great Highwaymen and Robbers, who used the Pha Yant and Look Hwaay Takror to Protect themselves. The Look Takror of Luang Por Sud is the subject of a Legendary story that is said to have helped a Thief Escape hundreds of Police, as he was surrounded, and slip through their hands with the power of the Magic Amulet assisting. 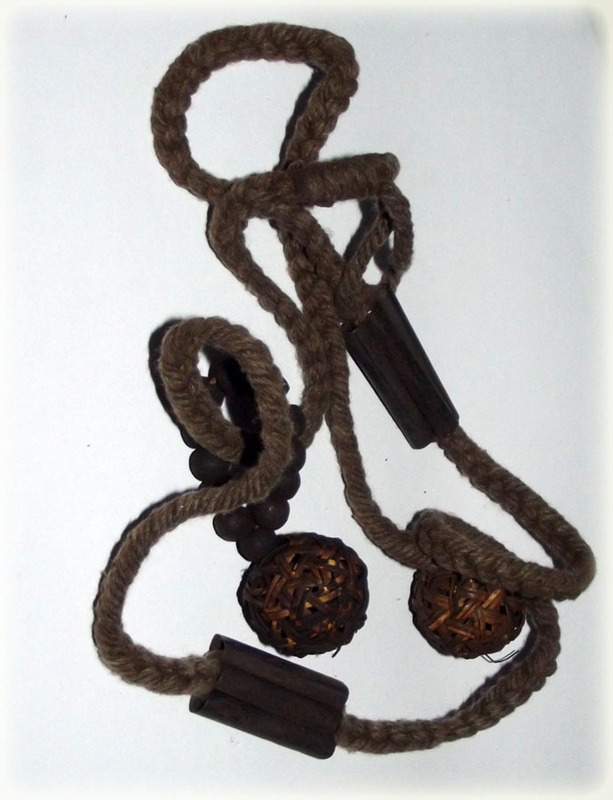 This is a very rare and Ancient Amulet for the collector of 'Thai Krueang Rang' (Buddhist, Occult, and Animist Charms), and is a matter of choice whether the owner wishes to preserve it in Museum Case or wear it for its Protective Powers. 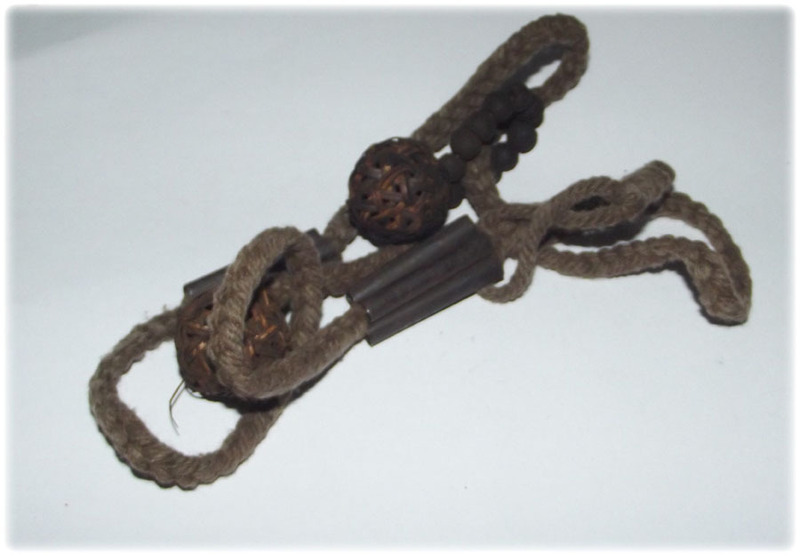 Please always Take Care with Authentic Sacred Ancient Amulets, and preserve their condition as best as possible, but also remember that amulets both Ancient and Modern, were designed and intended to be worn, more than they were intended to be kept in a Museum. 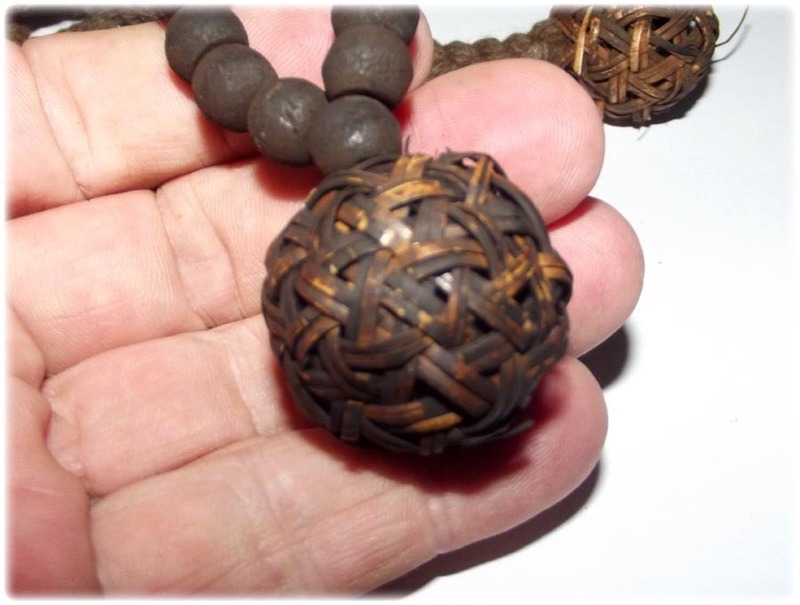 This exhibit borders on being a Personal Museum Collection Piece to be worn perhaps in rare and fitting circumstances, otherwise to be placed on its own altar for worship, or in a showcase if you are a home museum showcase amulet collector. 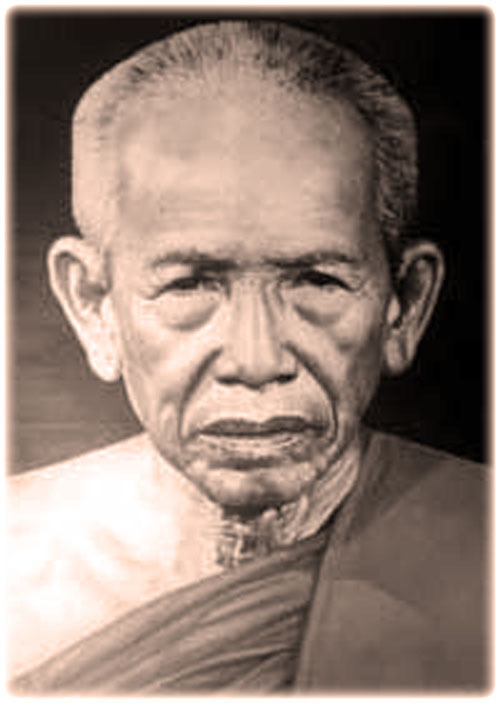 Luang Por Sud was born in the year 2445 BE on the 7th of May. 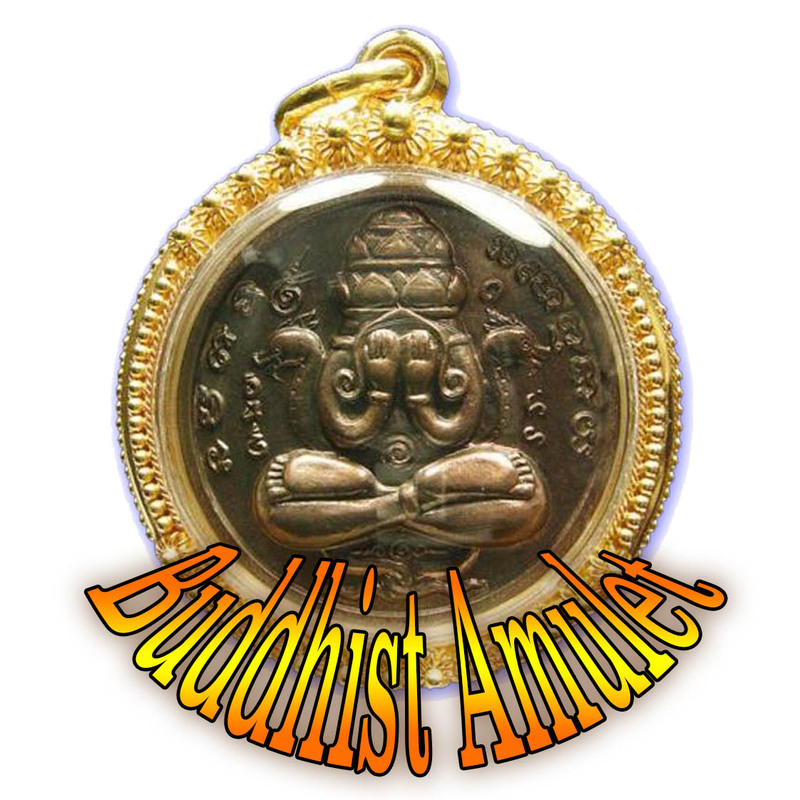 he ordained into the Sangha at the age of 16 as a Samanera Novice Monk. When he moved after becoming a fully fledged Bhikkhu to Samut Sakorn and stayed at Wat Ka Long, where he eventually became the Abbot through his long term diligence and meritorious acts. He became famous for his Wicha Yant Look Takror Whicker ball Yantra, which he had Mastered through the use of Khmer Sorcery methods. 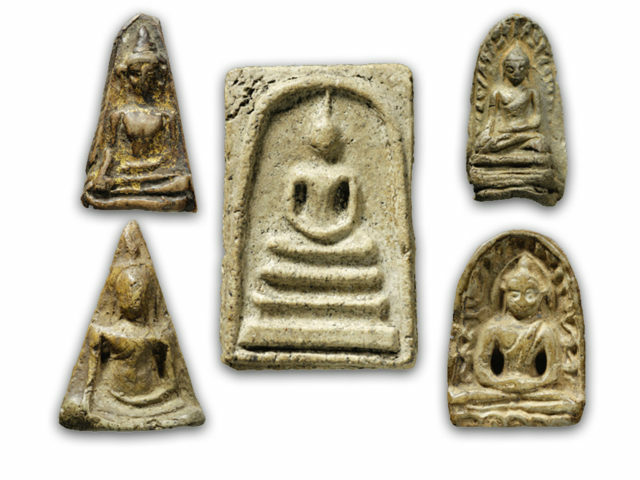 Luang Por Sud made many different kinds of amulets, but it is perhaps the Takrut, and hits Look Takror Wicha amulets (including the Pha Yant Takror) which are his most revered and famous for their Kong Grapan Chadtri and Klaew Klaad powers. Luang Por Sud became even more famous after his death in the year of his cremation in 2545 BE, when his body would not burn, and seemed impermeable to fire. So the temple committee was forced to give up trying to cremate him, and placed his remains in a glass coffin. The event fulfilled the Prophecy which had happened in the Dream of his first apprentice, Luang Por Chalong, where Luang Por Sud had appeared and told Luang Por Chalong that it would not be possible to light the Funeral Pyre, and that Luang Por Sud would do it himself, but that his bones would remain, for they could not be burned. This is a strange thing, because this kind of miracle also happened with the Arahant Saributra in the times of the Buddha, and it is said that the bones of Saributra cannnot be burned until the Future Buddha Maitreya comes, who shall burn them with Kasina Fire energy. 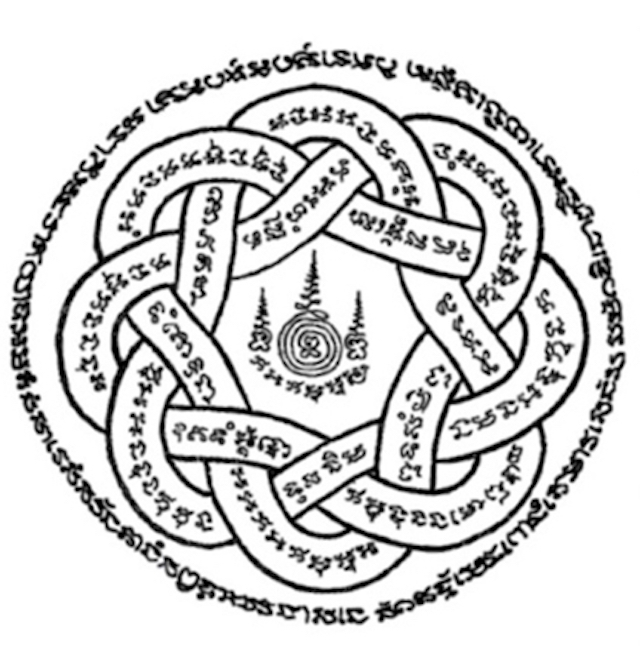 Below; The Famous Yant Takror Kong Grapan Chadtri Yantra of Luang Por Sud.